Hi everyone, I know I'm a rare visitor to this web site but I'd be grateful if anyone could help me. I own 3 UMK3 original arcade boards. The story goes - I originally had 2 one working and one not and made the classic mistake of switching good working parts into a non-working board. Anyway the non-worker fried a part/parts. So, then I owned 2 non-workers. So I bought another UMK3 board to trouble shoot and I've discovered PLCC chip U45 is fried. The first bosrd is a PLCC chip frier, so I don't intend to go any further with that one, but if someone on here has a spare U45 or non-working board going I'd like to hear from you. If any one knows some one who could help I'd also like to hear from you. It's a simple U45 chip swap to get my second board up and running again. Looking forward to hearing from someone. I would hit up hobbyroms.com man. They can do it all. It says New Kombatant, but I can remember the day they rolled in a fresh MK1 to my local arcade! Not sure what HobbyRoms can do, as it's a custom chip that I believe is encrypted and custom, but he may know people that have that part. 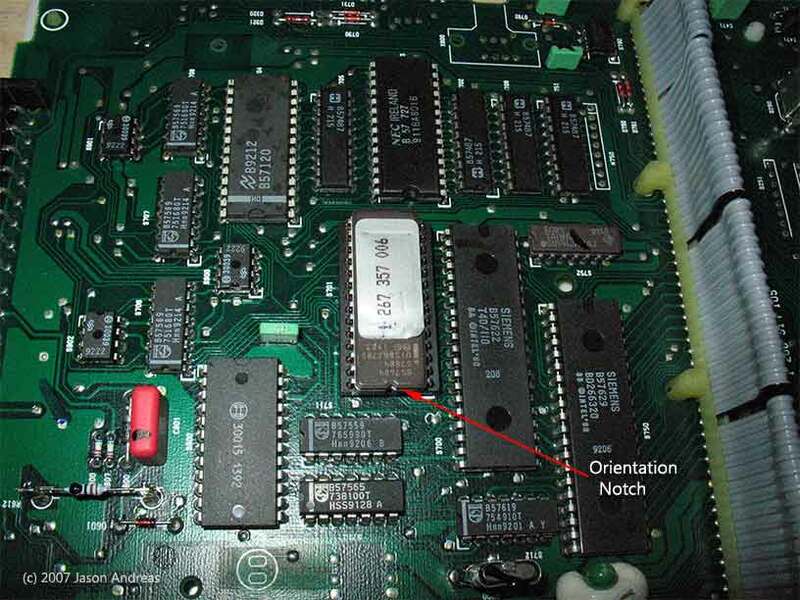 If a rom is inserted incorrectly it can cause the other chips to appear damaged when they aren't. This is not limited to eproms and can affect actual chips in the burn in test - it can also cause erroneous gameplay as if roms were bad while in reality are fine (though the inverted rom in question may need replacing). Always make sure the little notches are lined up correctly with the sockets. I discovered this after noticing a rom I put in had a bent pin, and after adjusting and reinserting it actually did so backwards. Thankfully it didn't damage anything but I replaced it anyway. Last edited by TerryMasters; 12-21-2010 at 04:36 PM. Hi, thanks for the lead. I know YourMKsource has a number of those chips but he's in Afghan for a fairly long time - unless he takes some leave. I'm sure I'm registered with KLOV so I'll give that a try, hope they're still on after all this time. Yeah the only people who may have extras are people who have bad boards sitting around where that part may be good. That is a tricky one really. I only have one UMK3 board, so I am sadly of no help. I need to get a MK3 only board too someday. Thanks for the help - something will turn up sooner or later. I sold an MK3 board about 3 months ago to an extremely happy Bulgarian. I had the whole set, but wound out MK4, MK3 and a few UMK3 boards and quite a few MK & MK2 boards. I like to dabble now and again, but I still have those MK turbo boards. Hey man, I have 6 extra boards in various states of disrepair. Also have lots of extra chips. U45 is one I think I have a couple of. I am out of town right now, but when I get back in a few days, I'll check and let you know. You might need to remind me. Hi Mike, You're a star. I'll send you a message in a few days. Thanks man. Hello, someone sells the U45 chip? I'm looking for my umk3 and mk3, thanks!